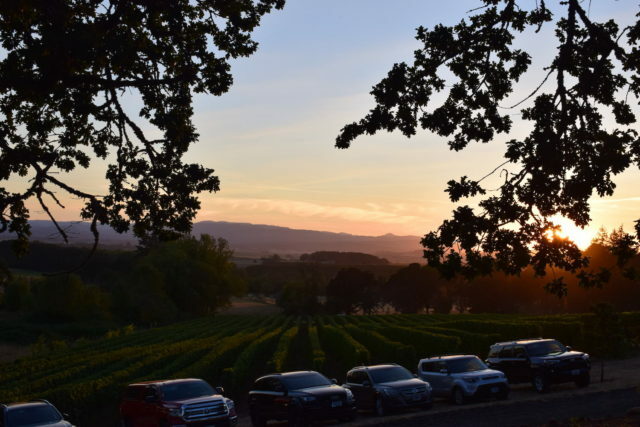 Sunset at Eola Hills Legacy Estate Vineyard, Oregon. Well it’s now almost three weeks since the total solar eclipse in America (21st August) and I’m back in the UK after a wonderful trip to the USA. The eclipse was beautiful, but too short, of course! I chose to be in Oregon for the eclipse, mostly because of the good chance of favourable weather at this time of year. 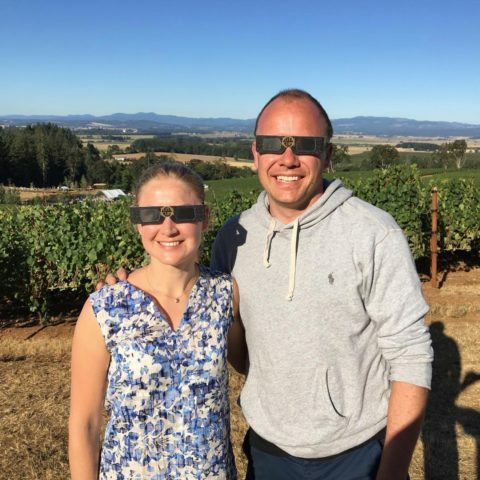 I was lucky to be at Eola Hills vineyard with my friend, Andy, where there was entertainment and enjoyment to be had over the whole weekend (the eclipse itself was Monday morning). 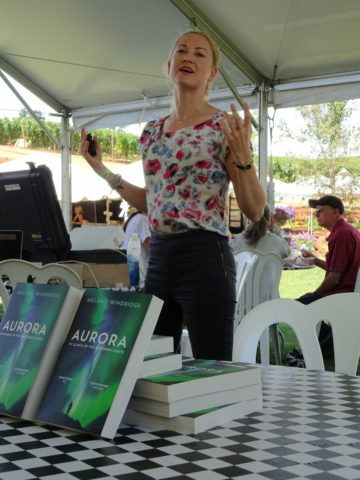 I gave a talk about eclipses and aurora on the Sunday, and signed some books. Getting animated whilst talking about eclipses, aurora and our connection to the sun. Monday dawned clear and warm. There was not a cloud in the sky. “Phew!” I thought. After breakfast, Andy and I went to find a good spot to watch the eclipse and get set up. We went uphill through the vines to a spot with a view out over the hills towards the coast. We laid out a blanket and I put up my tripod, finding a place where I could capture some of the landscape as well as the eclipsed sun during totality. 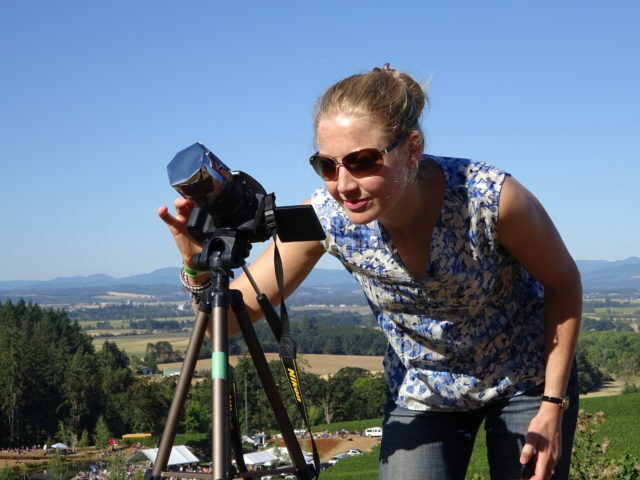 Photographing the partial phase of the solar eclipse. First contact came with an excited whoop from the crowd below us. It was about an hour till totality. I took some photographs at random intervals and we looked at the partially-eclipsed sun through our eclipse glasses. It got noticeably cooler, even when the sun was only half eclipsed. I put a jumper on, and later a gilet too. I hadn’t noticed the drop in temperature when I saw the eclipse in the Arctic in 2015 – it was already so cold there and I was so bundled up in clothing. In the last couple of minutes before totality we were looking out across the valley to the hills, the sun at our backs. From our elevated position we could watch the land get dark. It wasn’t like seeing a hard shadow come towards us, but the light did sink very rapidly suddenly. I turned around and saw the corona shining beautifully. I felt a buzz of excitement and exclaimed how wonderful it was as I removed the solar filter from my camera and took a couple of pictures. Solar eclipse triptych – partial, total, partial – 21st August 2017, Oregon. Alas, then I started faffing with my camera, trying to adjust it so that I could take the landscape shot I had planned before I had zoomed in to photograph the partial phase. I can’t remember why but I didn’t get it to work, so I missed precious seconds of that already-too-short totality. Aware of time passing I left the camera and I took up my binoculars to look at the corona. I could see its wispy structure – pinched a bit at the top and out to the right I think, but fairly uniform. I could see squiggly pink prominences. It was beautiful. Then I looked back to my camera and then suddenly we saw the bright diamond ring effect and it was all over. It felt like it had gone far too fast. Finally I managed to snap the photo of the landscape that I had wanted to take during totality – just a few seconds too late. We stayed at our viewing spot till last contact, even though everyone else around us packed up and went down for the barbecue lunch. I just wanted to be there till the end. The landscape of Eola Hills, Oregon, where we watched the total solar eclipse 2017. Taken just after totality with the sun still mostly obscured by the moon. Initially, I was disappointed that I had been distracted by my camera rather than fully appreciating the eclipse, but now I remember the excitement I felt when I first saw the eclipsed sun, and I remember examining the corona in detail through binoculars, so it was still a wonderful experience. I didn’t feel the awe that I felt that first time I saw an eclipse, in 2015 in the Arctic. But was it because I was distracted or because I already knew what to expect? Probably a bit of both. If you are witnessing your first eclipse I would recommend you to ignore your camera entirely and just give yourself fully to the experience. 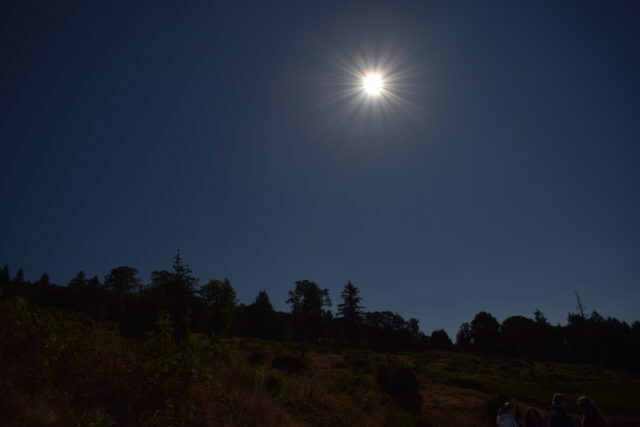 Or if you want to take photos (and you are an amateur like me) I would recommend setting up your camera beforehand so that you need to do NO ADJUSTING at all during totality, even if that means using two separate cameras for the partial and total phases. Eola Hills was a fantastic, friendly and beautiful place to be. I’d like to thank everyone there for making the Great American Eclipse so much fun. The next couple of eclipses will be in South America, so it’s time to start planning! 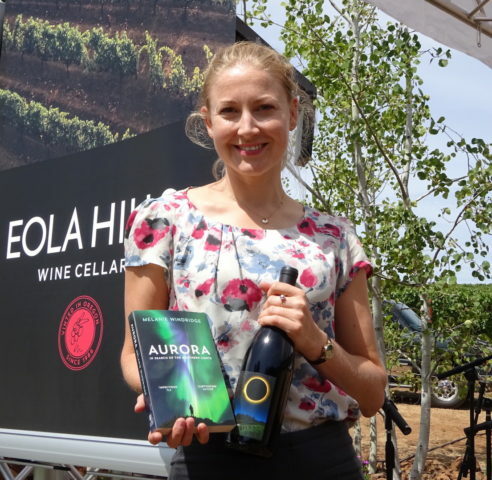 Melanie Windridge at Eola Hills Vineyard with her Aurora book and a bottle of Solar Eclipse pinot noir. Me and Andy in our eclipse glasses for viewing the partial eclipse.